You think you’ve come across a great new product this year? I’m about to raise the ante on ya. This little baby was submitted to me a few months back by a fellow Missourian, Jay Abbey. 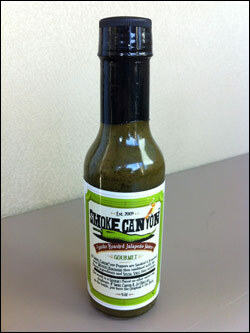 It’s called Smoke Canyon Gourmet Smoke Roasted Jalapeno Sauce. I have to tell ya, this was so amazingly delicious that I almost devoured the contents of the entire bottle before I was able to get some photographs of it with some food. This is just one of those little revelations like a Ring of Fire or a 1498, that upon tasting it, you know you’ve struck gold. No, much more than that – a diamond mine! What makes this sauce special is the miraculous performance it does as it straddles the line between have a fresh jalapeno flavor and a chipotle flavor. As you know, by its literal definition, that a “chipotle” is a dried, smoked jalapeno (although many sauce makers have broken that rule and have called just about any smoked chile under the sun a “chipotle”). To clarify, this is NOT a chipotle sauce, nor does it really have a heavy, smoky taste. Instead, perhaps like no sauce – or salsa – I’ve come across before, this really captures the distinctive tones of a roasted jalapeno chile pepper in a bottle. It’s a little smoky, somewhat “grill-like”, but it’s LOADED with huge flavor. And it’s vastly different than a lot of green/verde sauces you’ll find on the market, especially those that get their flavor profile from garlic, cilantro, and a combo of tart vinegary, almost “pickled” jalapeno components. One last thing I’ll mention before I dive into this review is the fact that as of this writing, Smoke Canyon has no website, so quick and simple ordering is out of the question. However, what you can do is reach Jay Abbey via e-mail at smokecanyon “at” gmail.com, or contact him on Smoke Canyon’s Facebook page, and inquire him about obtaining some of this “don’t miss” product for your product. Tell him I sent ya, and you’ll be glad you did!